Jaime Munguia (29-0, 25 KOs), the dangerous undefeated native of Tijuana, Baja California, Mexico, scored an emphatic fourth-round technical knockout victory against Sadam "World Kid" Ali (26-2, 14 KOs) of Brooklyn, N.Y. to capture the WBO Junior Middleweight World Title in the scheduled 12-round main event of HBO World Championship Boxing at Turning Stone Resort Casino in Verona, N.Y. Munguia was too big and powerful for Ali, sending him to the canvas several times before a left hook forced the referee to stop the fight at 1:02 of the fourth round. "This victory is something huge for me," said Jaime Munguia. "This is a dream come true. Every fighter dreams of this. I want to thank the Nevada Commission for making this opportunity possible as they didn't allow me to fight Gennady Golovkin. I want to show that I am ready to fight at the highest level and with the best fighters." "He [Munguia] caught me early," said Sadam Ali. "That's what affected me. I don't want to give any excuses. He was the better man tonight. I have to check with my team to see a what's next for me." Rey Vargas (32-0, 22 KOs) engaged in a hard-fought 12-round war as he defeated explosive Armenian contender Azat "Crazy A" Hovhannisyan (14-3, 11 KOs) to retain the WBC Super Bantamweight World Title in tonight's co-main event. Vargas used his significant length and reach advantage, though Hovhannisyan made the fight very tough with his relentless aggression. Vargas won with scores of 118-110, 116-111 and 117-111. "I'm very happy," said Rey Vargas. "This was a tough opponent, though he fights dirty and has his bad habits. He head-butted me a lot. It was important that I first take care of my head in this fight and then of course land my punches. Right now, it's time for me to rest and leave the decisions to my managers." "I have great respect for Rey Vargas, but I felt I controlled the fight with my aggression," said Azat Hovhannisyan." I landed the harder and cleaner punches. He got too much credit for pitty-patter shots. I felt it was close, but my constant attack won the fight." "This victory was all for my Uncle Beto in Mexico," said George Rincon. "Being able to adjust to a southpaw is always tough, but the plan worked well. Now I just have to be ready for the next one." "I'm super happy," said Diuhl Olguin. "Giving it my all in the later rounds when we were both tired was key to winning this fight. For my next fight, I want to face someone of a higher level to demonstrate that I really belong in this ring." "This was a rematch," said Alex Vanasse. "He [Santiago] called me out because he said the referee called it off too early. In reality, the referee saved his life. This time the referee called it off again and it was even clearer that he needed to." 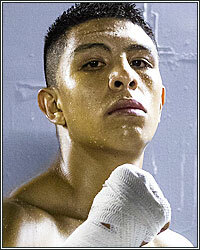 "I got really tired in there, and Lewis can really take a punch," said Luis Vargas. "After this fight I want to lose some pounds and go back to my normal weight of 154 pounds." "I felt good," said Lawrence Gabriel. "He [Vargeson] got me a couple times, but he didn't really hurt me. I saw that he was bending over a lot, so I looked for the shot to hurt him and stop him." Ali vs. Munguia was a 12-round fight for the WBO Junior Middleweight World Championship presented by Golden Boy Promotions in association with Zanfer Promotions. Vargas vs. Hovhannisyan was a 12-round battle for the WBC Super Bantamweight World Title presented by Golden Boy Promotions in association with Promociones del Pueblo. The event was sponsored by Tecate, "THE OFFICIAL BEER OF BOXING" and Casa Mexico Tequila. The event took place Saturday, May 12 at Turning Stone Resort Casino in Verona, New York. For more information visit www.goldenboypromotions.com, www.hbo.com/boxing and www.turningstone.com. Follow on Twitter at @GoldenBoyBoxing, @HBOboxing @TurningStone. Become a fan on Facebook at www.facebook.com/GoldenBoyBoxing, www.facebook.com/hboboxing and www.facebook.com/TurningStoneResort. Visit us on Instagram at @GoldenBoyBoxing and @TurningStone. Follow the conversation using #AliMunguia.